Check out our full written Watch Dogs review. Ubisoft has released nearly 10 minutes of footage showing off features of their hotly-anticipated open world hacking game, Watch Dogs. The game casts you as Aiden Pearce, a brilliant hacker with a dark past, trying to right some wrongs in whatever way you see fit as you hack and shoot your way around Chicago’s six, massive districts (including Pawnee, apparently). Below are the six topics covered in the video. Chicago is completely networked by the ctOS system, which you can freely abuse with more than 60 hacking skills. How you use them is up to you. You can wreak havoc in anyone’s digital life by accessing their phone, email, and bank accounts. Need to shake Johnny Law and get across town quickly? Hack into the traffic lights to cause an accident and then drop a blackout to slip out under cover of darkness. You can track criminal activity to be a hero and prevent it, or to get a piece of the action. Be careful, though, because all of your actions will affect your citywide reputation. Hacking skills alone won’t keep you safe, though. You will also need to carefully cultivate relationships throughout Chicago’s criminal underworld in order to get what you want. You’ll need the support of friends like fellow hacker Clara Lille, “who’s as dangerous as she is seductive,” Jordi Chin, a shady associate whom you can call in when you need to solve problems, or T. Bone, who likes to blow things up. 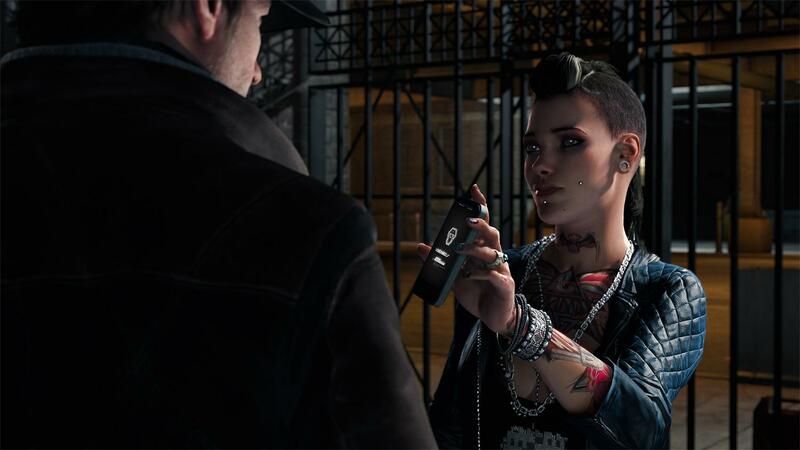 One of the more interesting features in Watch Dogs is the blurred line between single player and multiplayer. While there are explicit multiplayer modes, like Decryption Combat where squads fight for control over information nodes, or Free Roam, which seems like more conventional squad combat, other players are also able to hack into your single player game at any time. You can even find contracts on the heads of other players. When accepted, these contracts will reward you for hacking into and disrupting other players while they go about their single player game. That air of paranoia is a perfect complement to a game set in our cyberpunk near future. In addition to the game itself, Ubisoft is also releasing a companion app for Android and iOS devices. Jealous of a friend at home playing the game while you’re stuck at work? Use your phone to hack into and screw with their game for one of the aforementioned contracts. 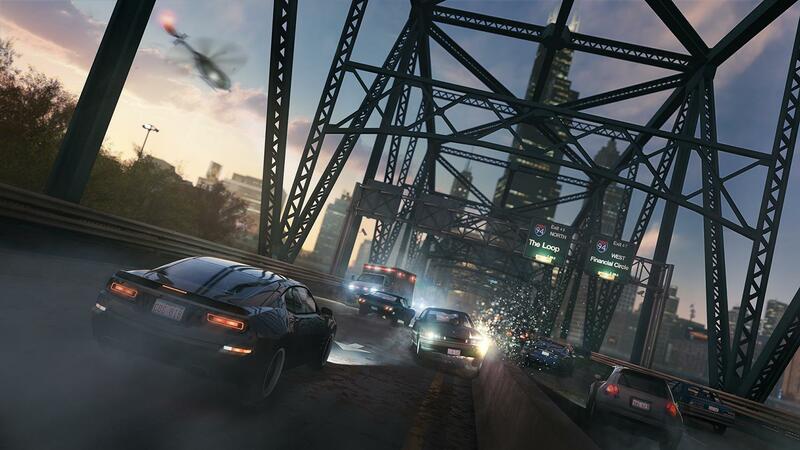 You can also challenge them to a racing mode where you use the app to control the ctOS infrastructure for the Chicago PD while they try and drive to safety. To get around Chicago you can hack (or just conventionally jack) over 70 kinds of vehicles. You can download the registration information of anyone’s car and have it delivered to you on demand with an app for your in-game phone that’s apparently the GrubHub for car theft. Having access to a nice ride will unlock a variety of jobs and challenges to make extra money, like being a transporter or getting fast and furious in the underground street racing circuit. Beyond hacking and stealing cars, your in-game phone will also be full of fun distractions to mix up your gameplay. Augmented reality games let you turn the city into “a sci-fi shooter with an 8-bit twist” or create roof-running courses dotted with virtual coins and hazards. Apparently the future of drugs is also online as you can download “Digital Trips” that let you turn the city into a burning hellscape, or fight off cops as a giant spider robot that looks right out of Ghost in the Shell. Originally set to be a launch title for the current generation of consoles, Watch Dogs will finally be available on May 27, so you can see for yourself if it lives up to the hype.